Roll For The Galaxy: Yes more Roll for the Galaxy, but its quickly becoming a favourite game! The rules are quite simple to pick up but I'm still learning the strategy of when to do what, and what side of the tiles to build etc. There's a lot of decisions every turn and a bit of guess work based on what you think your opponents will do - occasionally that leads to some dud turns, but when your plan pays off its a great feeling! Definitely recommend you give this a go if you haven't tried it yet. Once I feel I know the game well enough I'm sure I'll post a proper review. Pandemic Legacy: After what seems like the longest of breaks we finally got back together to play December in what we were expecting to be our last game. But nope. December had it's way with us and has left us with one final chance. It's going to be a long shot to complete December successfully, but if all goes well our campaign will end on a good note come Monday. Well either way its going to end as its the last possible game we can play. Bittersweet! 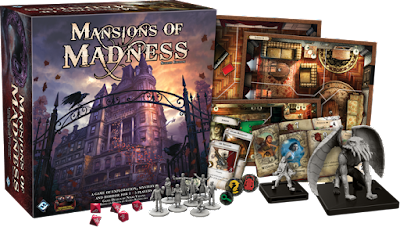 Mansions Of Madness 2nd Edition - Total impulse buy like most of the other games in the library. A fellow instagrammer sent me a link to Barnes and Noble 40% off a single item sale which brought the total price of this game to just $96 AUD including shipping. An absolute bargain so I couldn't resist. Have never played any game in the Lovecraft world, no idea if I'm starting with the right one, but eager to see what the fuss is all about! Love how the game is driven by an app (at least in theory.. yet to try it) which I'm hoping leads to some more immersion. Don't know when it will make it to the table, but I know I'll be loving it when it finally does! P.s. How big is the box?!! Dead Of Winter: The Long Night - I purchased this stand-alone expansion the same time I ordered Mansions as I figured saving a bit on shipping never goes astray. I love the first game and have had some good sessions with it (including my first one while in Canada), but it doesn't get out to the table often. There's a bit involved and you gotta have a decent amount of time committed which unfortunately means Dead Of Winter gets left out a bit. Did I need this in the library? Well seeing as I've only played the original 3 times in about 6 months of owning it - I don't think I should have bought this. But there's something pretty awesome just seeing The Long Night next to Dead Of Winter in the library, so I can justify it..